Roasting chicken is generally not something that I would consider doing in August, in fact, I have strict rules against turning the oven on once the temps go over 80 degrees (I know, I’m a wimp). But, while my friends and family in the US are sweating through this summer’s heat wave, I have been freezing through what the German weather teams have been kindly calling an “early autumn”. It has been a seriously weird summer here in central Europe. It started out spectacularly with a beautiful spring, and then apparently decided to skip summer and move right into autumn in early June. In fact, as I type this the outside temps are a blustery 61 degrees… in August! But enough of that, the weather has been so bad that I’m tired of listening to myself complain about it. Let’s talk about Dorie’s Roast Chicken for Les Paresseux, which translates to roast chicken for lazy people. Now how could you not love a recipe which starts out with such a great title? Dorie’s recipe was indeed a hit for this lazy person. It involves no more than throwing a chicken and some chopped root veggies into a Dutch oven and roasting everything together in the oven for a bit. Dorie calls for a 5 pound chicken, but there is no way I would ever find a chicken that big in Germany. The standard roasters around here tend to weigh in at 1 kilo, which is just a little over 2 pounds. So my little German chicken took a little over 1 hour in the oven and came out perfectly juicy and tender. 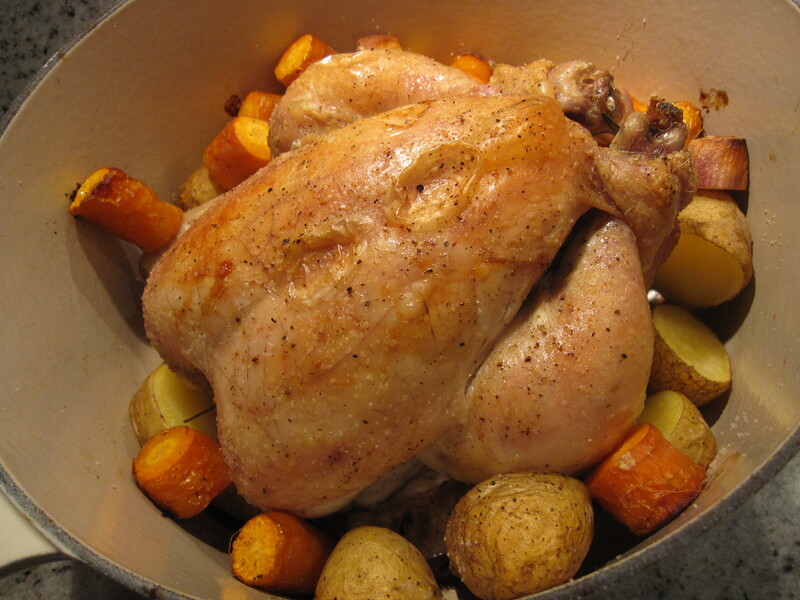 In short, every home cooks needs a go-to roast chicken recipe, and I think that I just found mine. This one is definitely a keeper. How fantastic was this recipe? So easy! Yours looks delicious.